Junior Stephanie Nauta and Head Coach Mark Guilbeau discuss making the NCAA Sweet 16 for the 5th consecutive season. Head Coach Sara O'Leary begins her second year with the 'Hoos with a little help from senior co-captain, Meghan Kelley. The Cavaliers fall to the Gamecocks in the second round of the NCAA Tournament. Head coach Sara O'Leary and sophomore Chloe Gullickson address the media after the win over VCU. 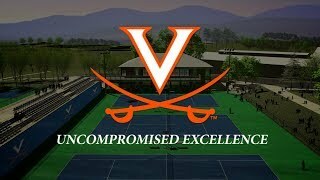 Virginia defeats VCU 4-2 to advance to the Second Round of the NCAA Tournament. 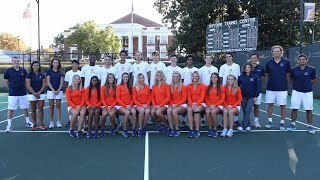 An inside look at Virginia Tennis with Director Andres Pedroso and Head Coach Sara O'Leary. 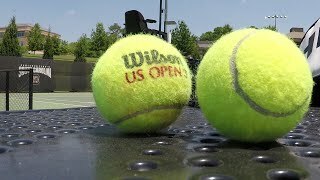 Director of Tennis and Men's Head Coach Andres Pedroso join's Women's Head Coach Sara O'Leary to discuss the new Virginia Tennis Facility at the Boar's Head Sports Club. 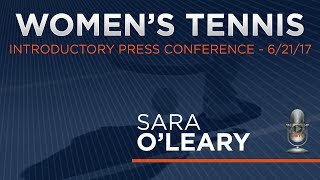 Excerpts from new 'Hoo head coach Sara O'Leary's introductory presser. 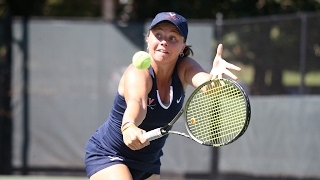 The CUE feature on the freshman seizing the opportunity to become Virginia's next star.